In 2018, we are seeing scientific advancements, nutritional supplement innovations, and changing consumer preferences having a big impact on the energy supplement category. This guide discusses the best energy supplements 2018 has to offer, and what ingredients and features you should look for to get the best energizing results. Everyone wants higher energy levels. In 2018, there are some key innovations and changes that are redefining the energy pill landscape. Second, modern overstimulation (which seems to be reaching epidemic proportions) means that fewer people want to get more stimulation in an energy supplement. Instead, consumers are moving to cell-oriented, crash-free energizers that do not rely on caffeine. Due to the massive demand for energy supplements, there are way too many low-quality supplements on the market — filled with junk and more likely to cause side effects. As a result of all these factors, consumers are seeking more research-backed boosters, superior ingredient forms, and better quality features than ever before when shopping for energy supplements in 2018. Let’s take a closer look at some of the ways in which 2018’s best energy supplements may increase physical and mental vitality. Due to the above and additional changing trends, in 2018 we see some new and different approaches to raising vitality levels. This means some interesting nutrients for different classes of energy support are now being featured. Some of the best energy supplements of 2018, including our top-rated energy booster, target cells’ power plant mitochondria. Nutrients that help with cell energy production are increasingly popular. They can shuttle electrons, improve cell efficiency, fuel cells, and boost cells’ powerhouse mitochondria to generate more ATP energy molecules. This energizing antioxidant cofactor is found throughout the body, and throughout biology. It is needed to spark the production as cell energy. In fact, it is a cofactor that transports electrons within the cells mitochondria. CoQ10 also has antioxidant activity that can help protect cells against damage after they charge up and fire with energy. CoQ10 has been shown to improve energy in the context of chronic fatigue. It is also good for supporting health of the body’s high energy organs, like the brain and heart. CoQ10 drawback: It can be hard to absorb. For maximum energizing effects, look for a CoQ10 form that is easy to absorb. PQQ is a great stim-free energy supplement because it boosts mitochondria, which are the cells power plants that produce energy. Specifically, PQQ seems to energize and protect mitochondria, as well as helping them to multiply within cells. 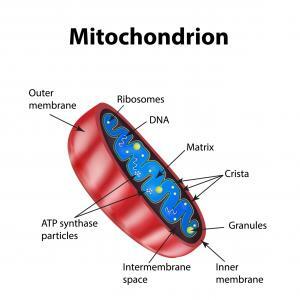 More mitochondria might mean healthier energy levels. Another big benefit of PQQ is that it is an antioxidant, supposedly 5000X as powerful as vitmain C. This means it protects the mitochondria from the damaging effects of free radicals that are generated during energy production. In addition to helping energy, PQQ has some brain-boosting properties that make it a good choice for energized, alert mental clarity without caffeine. B vitamins, like B12, are used in some of the processes that are involved in cell energy metabolism. B12 and some other Bs are hard to absorb with age, and may be especially helpful for older adults looking for some extra support for clean, stim-free energy. As a result, some of today’s best energy pills include the B-vitamins, usually in enhanced forms that are easier to absorb. Also known as the Universal Antioxidant, ALA can be absorbed through both fats and water. This means it is capable of protecting all parts of a cell, including the mitochondria that power all energy production. Most of all, however, ALA is functions as a cell energizer by serving as a cofactor in the conversion that ultimately produces adenosine triphosphate (ATP), the “currency” of cell energy. Some research has suggested that ALA supplementation may help to improve energy levels in people with fatigue, potentially due to its energizing and protective roles in cells’ mitochondria. Cell energy boosters are hot in 2018 due to their potential to enhance vitality throughout the whole body. Many people take energy supplements to fight the vitality-draining effects of fatigue. Capable of diminishing both physical and mental energy, fatigue may be caused by a lot of factors we are dealing with more than ever in 2018: Stress, multitasking, overstimulation, pressure and burnout. Adaptogens are herbs that can boost mental and physical energy by fighting the fatigue effects of heavy stress. Adaptogens’ energizing effects may be most apparent under difficult, grueling conditions, and they are famously used as competitive performance enhancers. Rhodiola rosea is a Russian root herb with a long history of boosting mental and physical energy. It works by regulating the endocrine system’s responses to stress, keeping them nicely balanced. By modulating the flood of stress hormones, this root herb helps to fight mental burnout and physical fatigue. Research has shown that rhodiola supplements appear to improve energy, with one study finding that the root eases symptoms of fatigue under stressful settings. Ginseng is another competitive energizer that has been used for a long time. It supplies active compounds called ginsenosides that are responsible for its energizing effects. Ginseng is known as a physical performance enhancer, great for strength and training. However, it is backed by more research for functioning as a mental energizer. Ginseng is well suited as an energizer for athletes who want to maintain intense, but clear-headed, peak physical performance. It can be used as a pre workout, and stacks well with sports energy formulas. L-carnitine is a good energizer for dieters because it drives fatty acids into cells mitochondria. These same fatty acids are used as fuel in the processes that generate ATP energy. In addition, L-Carnitine is a great energizer for athletes because it is highly concentrated in muscle tissue. It helps with explosive muscle power in weightlifting and other competitive spheres. This brain-boosting nootropic helps replenish the brain chemicals that are drained by stress, leading to brain fog and mental burnout. Supplementing with L-Tyrosine can help with many aspects of brainpower, including as an energy-booster — some research has suggested that L-Tyrosine boosts mental energy in challenging conditions, including stress and multitasking. Caffeine is a flat-out energy-booster, although its toll on the endocrine system can lead to short-term crashes and long-term burnout. Look for more advanced caffeine forms in the best energy supplements of 2018. Guarana is a good source of caffeine because it has research-backed benefits for alertness along with bonus antioxidants. In addition, several advanced and patented caffeine forms can now raise energy levels more smoothly, for a longer duration. Overstimulation is turning into a problem in 2018. Stimulants are everywhere, especially in supplements including fat burners, pre-workouts, and nootropics. And that’s not even counting your daily cup of delicious caffeine rich coffee. This is why we think stimulant-free energy supplements – like the cell energy boosters we talked about earlier – will be popular in 2018. Clean labels are going to continue rising in popularity throughout 2018, especially in the energy booster category. That’s because many energy boosters have dirty labels – artificial colors, artificial flavorings, synthetics and other additives in a questionable gelatin capsule. As well as megadoses of stimulants that are downright unhealthy. The time is right for super-clean, stimulant-free energy boosters that boost vitality in a healthier way. 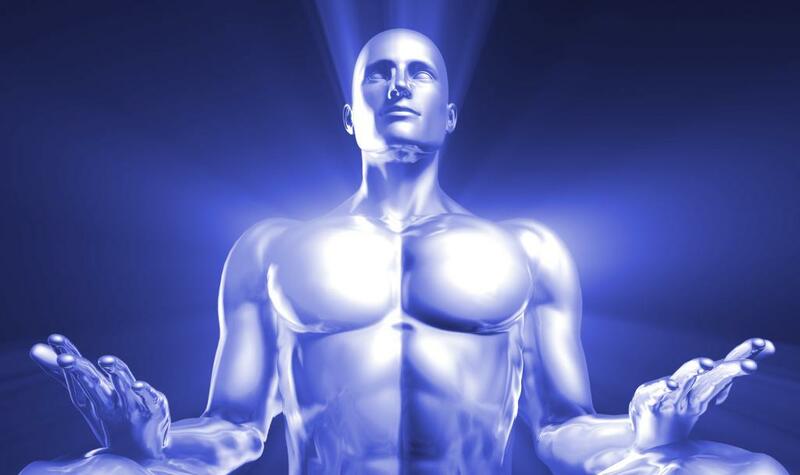 Energy at the cellular level is metabolism. Therefore, it is increasingly recognized that some of the best energy boosters can also help to support weight loss in a meaningful way. Mental energy is also more in demand than ever in 2018. Many of us get fatigue after demanding work days or hectic schedules, and can benefit from energy boosters that work on brainpower, specifically. 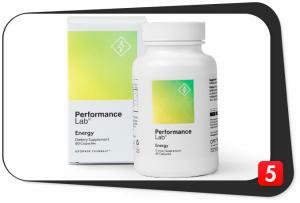 Performance Lab Energy is the overall best energy supplement of 2018 because it is the most advanced and cutting edge energy booster on the market. It boosts energy production with in cells in many ways, delivering what they call “life vitality.” That means that in addition to feeling more energetic, your cells are actually performing with greater efficiency – for broader-reaching benefits to weight loss, brainpower and training intensity. Plus, this formula is stimulant-free with the cleanest label in the category. 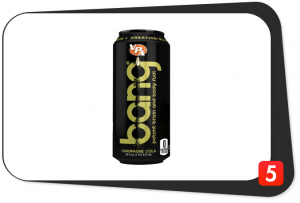 VPX Bang is an intensely caffeinated energy drink for bodybuilders. It includes some amino acids and creatine, and even some CoQ10. So this formula boosts energy in a lot of ways, including stimulation, muscle energy and cell energy. As a bonus, it is sugar-free. Just keep in mind it has 300 mg of caffeine per serving. Try the Purple Haze flavor. It’s delicious, especially for 0 calories. Ingredients: Carbonated Water, Citric Acid Anhydrous, Natural And Artificial Flavors, Caffeine Anhydrous, Sodium Benzoate (Preserves Freshness), Potassium Citrate Monohydrate, Sucralean® Brand Sucralose, L-Leucine, Potassium Phosphate Dibasic, Vitamin C (Ascorbic Acid), Calcium Chloride, Acesulfame Potassium, Potassium Sorbate (Preserves Freshness), Calcium Disodium EDTA, Magnesium Chloride, L-Isoleucine, L-Valine, Covalex (Covalently Bonded Creatine Glutamine Complex), Vitamin B3 (Niacinamide), CoQ10 (Coenzyme Q10), Vitamin B6 (Pyridoxine Hydrochloride), And Vitamin B12 (Methylcobalamin). Service: 30-Day money-back guarantee, as long as you don’t open it! 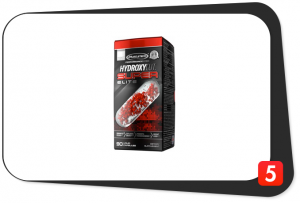 Made by one of the leading manufacturers of sports nutrition-oriented fat burner supplements, this energy formula is among the most intense on the market in 2018. Don’t even think about taking it if you can handle your stimulants. But if you are a stim junkie, then this blend of caffeine, yohimbine, black pepper extract, B-vitamins, nootropics, and fat burners will give you the powerful energy-boosting support you are looking for. Service: 30-day money-back guarantee is offered, but you have to pay the return shipping costs. Irwin Naturals Triple Boost Caffeine Free Energy throws a lot of interesting compounds – all stimulant free – into a powerful multifaceted stack that is unlike any other energy pills on the market in 2018. It has a few of our energy boosters to look for, including l-carnitine, L-Tyrosine, B vitamins plus ginseng. Additions of Spirulina, Maca root, bee pollen and royal jelly bring some more exotic non-stimulant energy to the party. Irwin naturals is also a good quality brand to buy from. 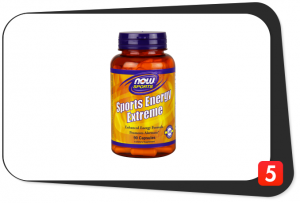 NOW is a reputable brand that has been around for a long time, and this sports-energy oriented formula is a good bet. 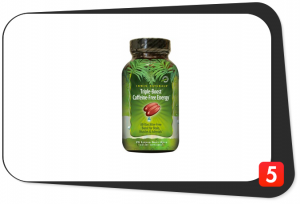 It supplies a few of the energy boosters we look for, including caffeine, Rhodiola, ginseng, tyrosine, and co-Q10. There are a few fat burners and muscle nutrients in there as well, making it a good choice for athletes training in a gym. Sports energy extremes blend of stimulants, green tea and adaptogens are smartly designed for energy without crazy jitters. Advanced Delivery: No. Plain capsule only. If you are looking for naturally increased energy levels, there are more effective energy boosters to choose from than ever before. Any of the above five best energy supplements of 2018 are a good choice. Consider reading our full reviews of these energy supplements to help decide which one is right for you, and be sure to come back soon to Best 5 Supplements for updated rankings and more.